Would you like to be an ordinary teenager by day and singing sensation by night? If so, then go for one of our Hannah Montana Halloween costume ideas! With our sensational Hannah Montana costumes, you will be able to create a Halloween performance that no one will forget. These Halloween costume ideas allow both teens and tweens to dazzle audiences and friends! Hannah Montana Halloween costumes never go out of style and are fun to put on for Halloween and different costume parties such as birthdays, anniversaries, and others. Here you will find two different Hannah Montana costume ideas, one of which includes a cute pink dress with ruffled skirt and a hat, and the second one is all about purple sequins, purple leggings, and white boots. Choose one of the available Hannah Montana costume ideas for Halloween and create your own Halloween party for celebrities. Ask your friends to dress up as their favorite heroes or musicians to have a TV show theme party! Hannah Montana Halloween costumes are the coolest ones around. This girl is adored by many people of different ages. 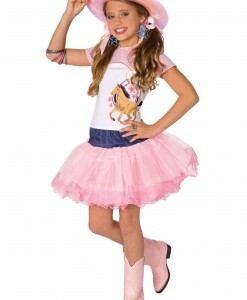 Your daughter will surely go wild when her Hannah Montana costume for Halloween arrives. 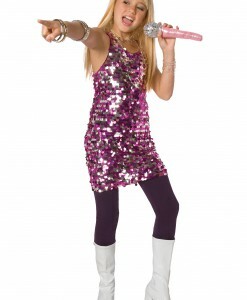 Have your daughter rock it out in one of our adorable Hannah Montana costumes. A sequin top and a pair of boots, or a pink dress with a cute hat – no matter what Hannah Montana costume idea you like better, as long as we have them both covered. All of our Hannah Montana costumes offer a great opportunity to team up with your friends for some very special Halloween photos. With such a variety of Hannah Montana Halloween costume ideas, it is difficult to pick up just one. We have all your Hannah Montana costume needs covered with free delivery anywhere in the U.S., Canada, and the UK. Buy also other Disney Costumes For Kids & Adults: Frozen Costumes For Halloween and Sleeping Beauty Costumes for kids parties and other occasions.